machinery, office equipment, pallets, and more. This sturdy dolly is constructed of aluminum channel which will support 2,000 lb. capacity. Lightweight design allows personnel to conveniently pick up and carry to destination. Four swivel 5"x2" phenolic casters will provide extra mobility on tight turns. 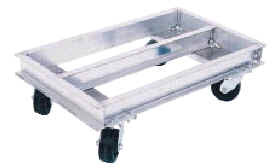 Plate Dollies are manufactured with a 3/8" raised pattern, aluminum or steel treadplate. A smooth deck is available upon request. Dollies are approximately 6-5/8" high, and have 4" x 2" molded rubber wheels standard, 2 locking swivel and 2 rigid. Casters are welded on steel dollies, and bolted on the aluminum. Capacity is 1,400 lb. 1. Optional Loops and Handle work great on any "Move Master" for pushing or pulling either end. 2. A center support crossbar is available as an extra support on larger loads.